Sutter County is included in the Yuba City, CA Metropolitan Statistical Area as well as the Sacramento- Roseville, CA Combined Statistical Area. The county is located along the Sacramento River in the Sacramento Valley. 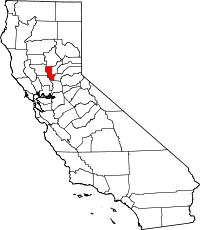 Sutter County was one of the original counties of California, created in 1850 at the time of statehood. Parts of the county were given to Placer County in 1852. Sutter County is named after one of the state’s more engaging and complex historical personalities, and an agricultural visionary. John Augustus Sutter, a German native born to Swiss parents, was one of the first to recognize the Sacramento Valley for its potential as an agricultural empire, and his Hock Farm, established in 1841 on the Feather River just south of present-day Yuba City, was the site of the valley’s first large agricultural enterprise. Sutter obtained the Rancho New Helvetia Mexican land grant, and called his first settlement New Helvetia (which included the present day city of Sacramento). In 1850, Sutter retired to Hock Farm when gold seekers deprived him of most of his holdings at Sacramento. Sutter County is the birthplace (Yuba City, 1858) of John Joseph Montgomery, who was the first American to successfully pilot a heavier-than-air craft, 20 years before the Wright Brothers, and who held the first patent for an "aeroplane." According to the U.S. Census Bureau, the county has a total area of 608 square miles (1,570 km2), of which 602 square miles (1,560 km2) is land and 6.1 square miles (16 km2) (1.0%) is water. It is the fourth-smallest county in California by total area. Some 88 percent of the county is prime farmland and grazing land. Sutter County is home to the Sutter Buttes, known as the "World's Smallest Mountain Range." This volcanic formation provides relief to the otherwise seemingly flat Sacramento Valley. Bordered by the Sacramento River on the west and the Feather River on the east, Sutter County has 240 miles (390 km) of levees. The Sutter Bypass, which diverts flood waters from the Sacramento River, cuts through the heart of Sutter County. Sutter County also has the State Feather River Wildlife Area, consisting of the Nelson Slough, O'Connor Lakes, Abbott Lake, Shanghai Bend, and Morse Road Units in Sutter County. Also, a 1795-acre State Park in the Sutter Buttes. In addition, there are the state public trust lands of the Feather, Bear and Sacramento rivers as well as smaller streams including Butte Creek and Butte Slough. Yuba Sutter Transit operates local bus service, as well as commuter runs to Downtown Sacramento. Sutter County Airport is a general aviation airport located just south of Yuba City. Sutter is a strongly Republican county in presidential and congressional elections. The last Democrat to win a majority in the county was Franklin Roosevelt in 1940. As of the census  of 2000, there were 78,930 people, 27,033 households, and 19,950 families residing in the county. The population density was 131 people per square mile (51/km²). There were 28,319 housing units at an average density of 47 per square mile (18/km²). The racial makeup of the county was 67.5% White, 1.9% Black or African American, 1.6% Native American, 11.3% Asian, 0.2% Pacific Islander, 13.0% from other races, and 4.6% from two or more races. 22.2% of the population were Hispanic or Latino of any race. 10.3% were of German, 9.0% American, 7.1% English and 6.1% Irish ancestry according to Census 2000. 70.3% spoke English, 17.9% Spanish and 9.3% Punjabi as their first language. There were 27,033 households out of which 37.9% had children under the age of 18 living with them, 57.0% were married couples living together, 11.7% had a female householder with no husband present, and 26.2% were non-families. 21.2% of all households were made up of individuals and 8.6% had someone living alone who was 65 years of age or older. The average household size was 2.87 and the average family size was 3.35. In the county, the population was spread out with 29.0% under the age of 18, 9.2% from 18 to 24, 28.2% from 25 to 44, 21.3% from 45 to 64, and 12.4% who were 65 years of age or older. The median age was 34 years. For every 100 females, there were 98.0 males. For every 100 females age 18 and over, there were 94.3 males. The median income for a household in the county was $38,375, and the median income for a family was $44,330. Males had a median income of $35,723 versus $25,778 for females. The per capita income for the county was $17,428. About 12.1% of families and 15.5% of the population were below the poverty line, including 21.3% of those under age 18 and 7.7% of those age 65 or over. MySYtv.com provides television coverage of local events in the area. ^ Capace, Nancy (1999). Encyclopedia of California. North American Book Dist LLC. Page 448. ISBN 9780403093182. Wikimedia Commons has media related to Sutter County, California.